With all stacks, caution is recommended. Nootropics are powerful, and all brains are different, so combining them carelessly may have risks. Always make sure you try out the components individually first to verify that they work as intended for you, and don’t have any unwanted side effects. Especially Phenibut is sensitive to exact dose, with the optimal amount varying from person to person. Some exploration is necessary here. This is the stack to get your creative juices flowing! Do you need to do design work? Compare your partner to a summer’s day? Or find a really out-of-the-box solution to an impossible problem? Give this stack a try, and see what your brain can do for you. Taking this stack can boost your creative capacities for two to three hours, or up to 5 with an extra dose of Aniracetam. Residual effects last up to 10 hours afterwards. 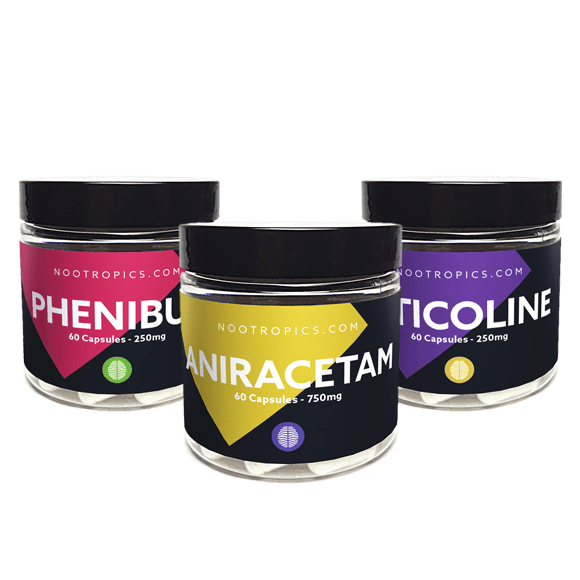 This stack is not intended for extended or daily use, primarily because of the Phenibut. Twice per week is the recommended maximum, not on consecutive days. Phenibut is sensitive to exact dose, with the optimal amount varying from person to person. Start with 1 capsule and go from there. Aniracetam, similar to other racetams, has benefits to cognition and motivation. What makes Aniracetam unique is its reduction of anxiety and boost to creativity. Aniracetam has a shorter half life than Phenibut, so if necessary, a second dose of Aniracetam can be taken after 3 hours to extend the effects of this stack. Phenibut boosts confidence, extroversion, and creativity. Often used as a confidence booster for social occasions, its effects can help you explore directions and tangents that otherwise would go unnoticed. Phenibut is very sensitive to dose from person to person, so some experimenting is necessary to find where on the range of 1 to 4 capsules your ideal amount is. Capsules per day: 1 to 4 capsules of Phenibut; 1 capsule of Citicoline; and 1 capsule of Aniracetam with optionally an additional one after 3 hours. Effect duration: Peak effect for 2 – 3 hours, extended up to 5 with another capsule of Aniracetam. Residual effects up to 10 hours afterwards. Extended use: This stack is not meant for extended use, mainly because of the inclusion of Phenibut. Take this stack twice a week at most, not on consecutive days. The optimal dose of Phenibut varies between individuals, and exceeding your personal upper limit may compound side effects without benefit. Beginning with the smallest amount will allow you to test effects with due caution. Combining Phenibut with benzodiazepines or GHB is dangerous and can promote respiratory depression in high dosages. Do not consume alcohol if you have taken Aniracetam or Phenibut. Mixing Phenibut and alcohol increases the toxicity of both, and can be hazardous to health.